Draexlmaier Group supplies multiple parts to the new Porsche Panamera, including the center console, door trim and cockpit module (developed in collaboration with climate control specialist Behr GmbH & Co. KG of Germany). Each cockpit module is tailored to the customer's needs, which required Draexlmaier to establish a new just-in-sequence site 10km from the Porsche assembly plant in Leipzig, northeast Germany. Porsche assembles the Panamera at a plant originally built for the Cayenne premium SUV. Porsche invested more than 150 million euros in the facility to add production of the four-door coupe-styled sedan. The car's starting price in Germany is 94,575 euros. The Panamera also features a seven-speed dual-clutch transmission from ZF Friedrichshafen AG. Cars with the fast-shifting transmission, which is standard on most Panamera variants, also feature stop-start. Combining the dual-clutch transmission with stop-start, which turns off the engine when the car is at a full stop, reduces fuel consumption by more than 5 percent. Stop-start systems place an additional burden on the car's battery, which has to supply all the energy for the vehicle when the generator is not running and also has to start the engine more frequently. German partsmaker Moll supplies the Panamera's advanced battery, which is designed especially to handle those requirements. 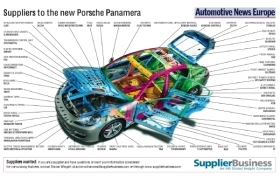 German supplier FTE Automotive GmbH contributes the Panamera's complete hydraulic clutch actuation system. The supplier also will provide a new clutch actuation system to the forthcoming gasoline-electric hybrid version of the Panamera. Other noteworthy features include Continental AG's adaptive air suspension system, a standard fit on the Panamera Turbo variant and optional on the other two models (the Panamera S and Panamera 4S). Magna Seating provides sophisticated power seats that have individual climate control units. Additional options include sport seats and rear-seat entertainment systems. Furthermore, the vehicle may be equipped with either a Bose Corp. or a high-end surround sound system from Burmester Audiosysteme GmbH of Germany.